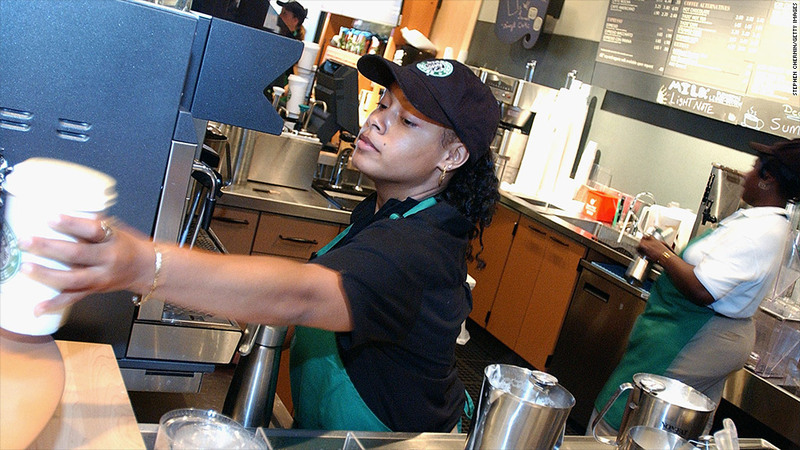 Starbucks says it is unaffected by New York City's 16-ounce cap on sugary drinks. Mayor Michael Bloomberg's sugary drink restrictions go into effect at midnight Tuesday in New York, but Starbucks has shrugged them off, saying it's exempt. The new law will restrict sugary drinks to no more than 16 ounces. But a Starbucks (SBUX) spokeswoman confirmed to CNNMoney that the coffee company isn't making any immediate changes to its menu. "Because customers can make so many choices in their beverages, we feel that most of the beverages fall outside of the ban," said Starbucks spokeswoman Linda Mills. She also said the ban doesn't apply to "customizable" drinks, such as coffee and tea, because the customer puts the sugar in the drink, not the retailer. In theory, the customer can put as much sugar as he or she wants into the drink. Mills also said the restrictions do not apply to drinks that are at least 50% milk, such as lattes and cappuccinos -- or even milkshakes. "Any beverage, like a milkshake, that is more than 50% dairy is exempt from the ban," she said. The company said it will "evaluate" its menu during the initial three-month period after the restrictions are imposed. City health inspectors could issue a notice of violation and $200 fine to companies that shirk the rules. "By addressing the increasing size of sugary drinks, the Health Department is taking an important step in reducing sugary drink consumption and combating the obesity epidemic in New York City," said Bloomberg's office in a statement. This isn't the first time the mayor has brought down the hammer on unhealthy habits. Early in his tenure, in the early 2000s, he outlawed smoking in bars.